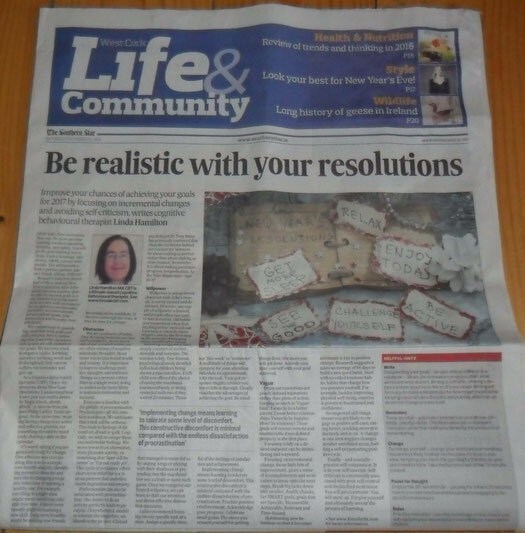 West Cork readers may have noticed my New Year resolutions piece in the December 31st edition (pictured) of The Southern Star, which suggests people can improve their chances of achieving their 2017 goals by focusing on incremental changes and avoiding self-criticism. Not all of the newspaper article appears in the online edition so I've pasted the text of the full article below. New Year. New Resolutions. New You. No more procrastinating, mindless spending, drinking, and eating. You will get fit, quit smoking, lose a stone, learn a language, save money, travel, connect with people. You will become a better person, partner, parent, friend, sibling. Research indicates almost half of those making New Year resolution have infrequent success; another quarter has no success at all (continued below). Is it any wonder our noble intentions are met with resistance? In our quest to revolutionise ourselves, we overcommit, set unrealistic goals, lose motivation and become overwhelmed. We compensate by punishing ourselves with guilt and self-criticism, falsely believing that if we whip ourselves into action we will commit to our goals. We become stuck in negative cycles, berating ourselves for being weak and ill-disciplined. Self-esteem suffers, we surrender and give up. As a cognitive-behavioural therapist (CBT), I’ve reservations about New Year resolutions. I understand how a new year can instil a desire to “begin afresh, afresh, afresh”, to borrow from the poet Philip Larkin. Goals are good. At the same time, creating lasting change is an active and reflective process, not something dictated by mindlessly obeying a date on the calendar. It’s worth asking if you are genuinely ready for change. One effective way of evaluating this is to do a simple cost-benefit analysis, identifying potential obstacles and benefits to changing a negative behaviour or learning a healthy one. For example, enrolling in a night class might mean sacrificing valuable free time. A short-term benefit might be learning a new skill. Long-term benefits might be making new friends, becoming more confident. If the pros outweigh the cons, it may be time for change. We are creatures of habit. Our thinking patterns are fast and automatic. As we move out of our comfort zones, we are often victims of negative automatic thoughts, those inner voices that breed doubt and anxiety. It is important to learn to challenge punitive thoughts and embrace change as a process rather than as a single event; doing so makes us far more likely to maintain motivation and succeed. Everyone is familiar with the pitfalls of procrastination. Psychologists call this emotion avoidance. We anticipate that a task will be arduous. This leads to feelings of discomfort, dread or guilt. Logically, we wish to escape these uncomfortable feelings. We move towards an alternative, more pleasant activity, rationalising that “later will be better” or “I’m not ready yet”. This cycle of avoidance offers short-term relief but is a vicious pattern that underlies much depression and anxiety. Perfectionism can also be associated with procrastination. Our desire to do an activity perfectly leads to paralysis. Overwhelmed, unable to tolerate the imperfect, we abandon the project. Clinical psychologist Dr Tony Bates has previously cautioned that often the intentions behind our resolutions “seems to be about making us perfect rather than about making us more human”. Remember, it is about making persistent progress, not perfection. As Nike says – just do it! Willpower is not an innate character trait; like a muscle, it can be trained and developed. However, our supply of willpower is limited, and people often succumb to bad decisions, old habits and temptation when feeling fatigued or stressed-out. Learning to identify these triggers can be the first step in the process of bringing about meaningful change. Resisting temptation isn’t simply a matter of mental strength and restraint. Distraction is key. One famous psychological study detailed individual children being shown a marshmallow. Each child was offered the choice of eating the marshmallow immediately or being rewarded with two if they waited 20 minutes. Those that managed to resist did so by singing songs or playing with their shoelaces or pretending that the marshmallow was a cloud or some such game. Once we recognise our limited willpower, we can learn to shift our attention and devise effective distraction measures. I also recommend focusing on one specific task at a time. Assign a specific time, not “this week” or “sometime”. A multitude of things will compete for your attention. Schedule an appointment with the task. Your gut response might convince you not to follow through. Clearly visualise the advantages of achieving the goal. Be mindful of the feelings of satisfaction and achievement. Implementing change means learning to tolerate some level of discomfort. This constructive discomfort is minimal compared with the endless dissatisfaction of procrastination. Practise positive reinforcement. Acknowledge your progress. Celebrate small gains. The more you reward yourself for getting things done, the more you will get done. Actively visualise yourself with your goal achieved. Often our resolutions are poorly defined aspirations rather than plans of action, keeping us stuck in vague-land. I want to be a better parent. I want better relationships. I want to be happier. How? In what way? These goals will remain remote and unattainable if not defined properly in the first place. Focusing solely on a desired endpoint can be intimidating and wayward. Focusing on incremental change, those little bits of improvement, gives a sense of accomplishment and motivation to move onto the next steps. Break big tasks down into smaller, doable chunks. Set SMART goals, goals that are Specific, Measurable, Achievable, Relevant and Time-bound. Habituating new behaviour so that it becomes automatic is key to positive change. Research suggests it takes an average of 66 days to build a new good habit. Start with so-called keystone habits; habits that change how you perceive yourself. For example, besides improving physical well-being, exercise is proven to boost mood and confidence. An improved self-image means you are likely to engage in positive self-care; eating better, working more productively and so on. A change in one area triggers changes in other unrelated areas, fuelling a self-perpetuating positive cycle. Finally – and crucially – practise self-compassion. It is in your self-interest. Self-criticism is consistently associated with poor self-control and diminished motivation. You will procrastinate. You will mess up. Forgive yourself and ultimately savour the process of learning. • Write. Documenting your goals – on your phone, online, or in a notebook – allows you to measure progress, chart what works and what doesn’t. Writing is cathartic, offering a distance and perspective on the stuff in our heads. Writing will force you to make a detailed plan for how to get the job done. Keeping a journal takes discipline and practise, skills that underpin the change process itself. • Reminders are vital – automate reminders on your phone, calendar, use a to-do list. Checklists allow you to compartmentalise rather than feeling burdened by the pressures of remembering. • To change yourself – change your world and surroundings. You are less likely to binge on chocolate if it’s not in plain view, tempting you. Have the gym bag by the door so you don’t need to think. Take the batteries out of the TV remote control! • Employ the 20-second rule – pausing for a mere 20 seconds makes you less reactive and less prone to engaging in destructive behaviours. • Practise relaxation. Learning to manage stress means you will regulate your mood and are more likely to make better choices.